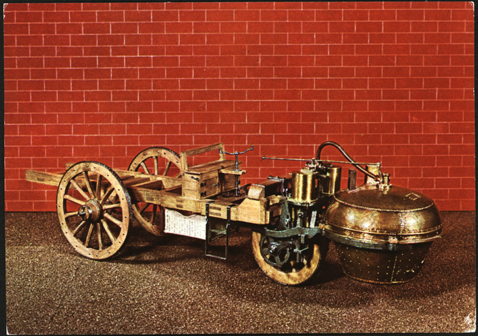 The Cugnot Steam Wagon is generally considered to be the first automobile. 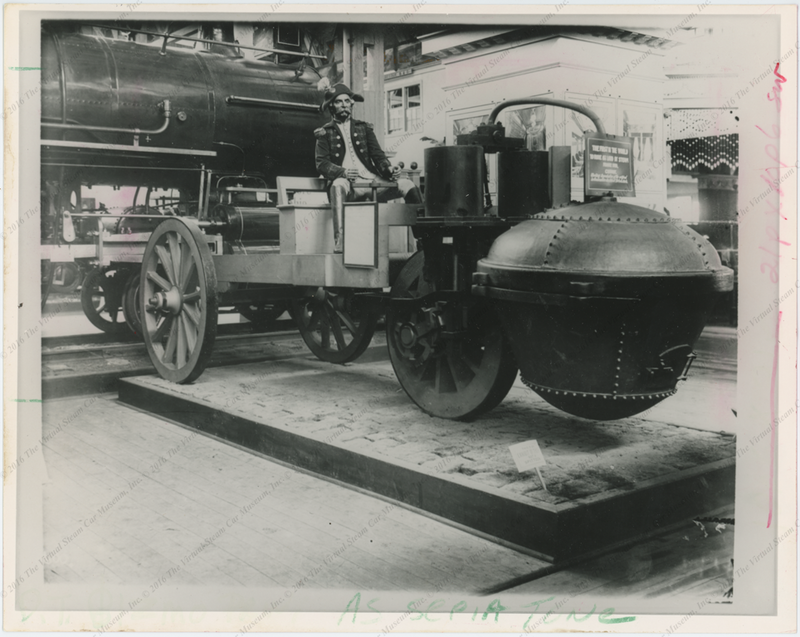 The first self propelled road vehicle. 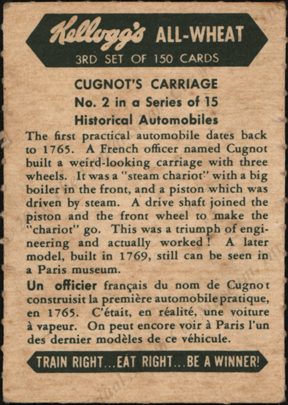 It can be seen today in Paris at the Musee des Arts et Metiers. 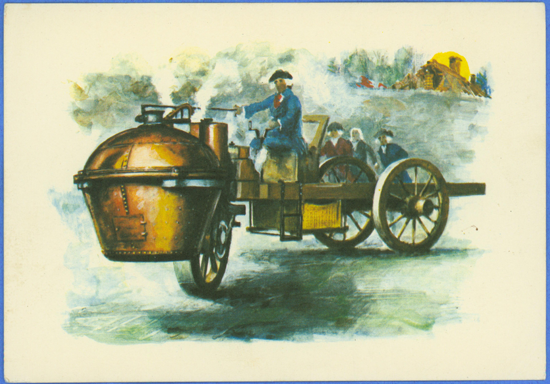 Being such a famous vehicle, Cugnot's Steam Wagon's image has been reproduced numerous times, and museum modelers have created miniature reproductions for exhibits. 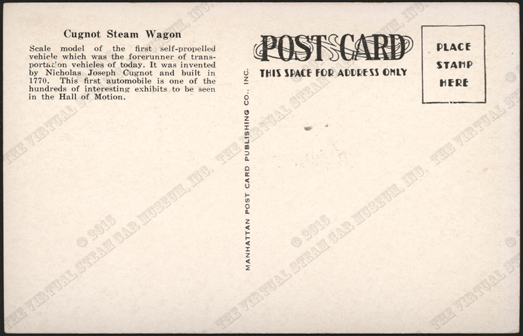 The material in the Virtual Steam Car Museum falls primarily into this catagory. 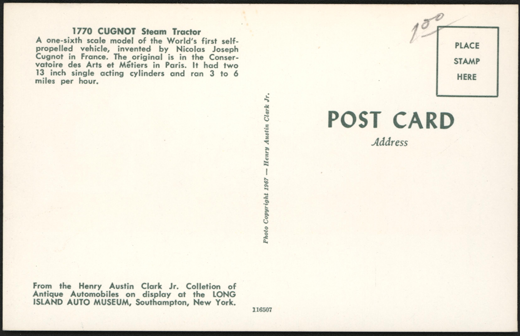 The New York Museum of Science and Industry opened in 1936. It would be interesting to research its history. 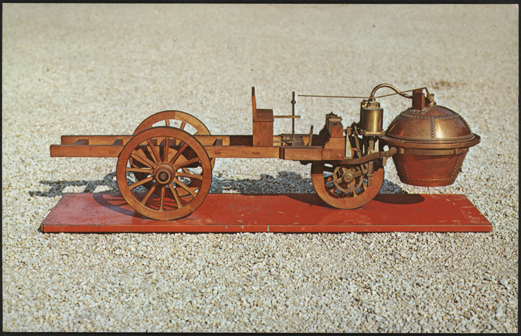 The Museum of Transport and Communication in Budapest produced this image of the Cugnot Steam Wagon, dating it 1769. 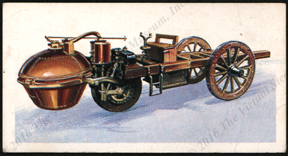 Henry Austin Clark's Long Island Auto Museum in Southhampton, NY featured this model of the Cugnot Steam Wagon. 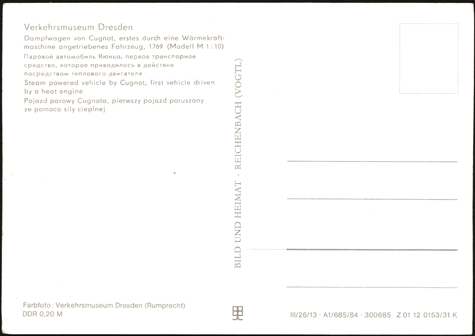 This Cugnot postcard comes from the Dresden Transport Museum. 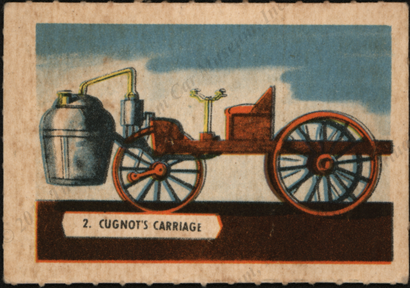 The Cugnot Steam Wagon appeared on a series of bubble gum cards. 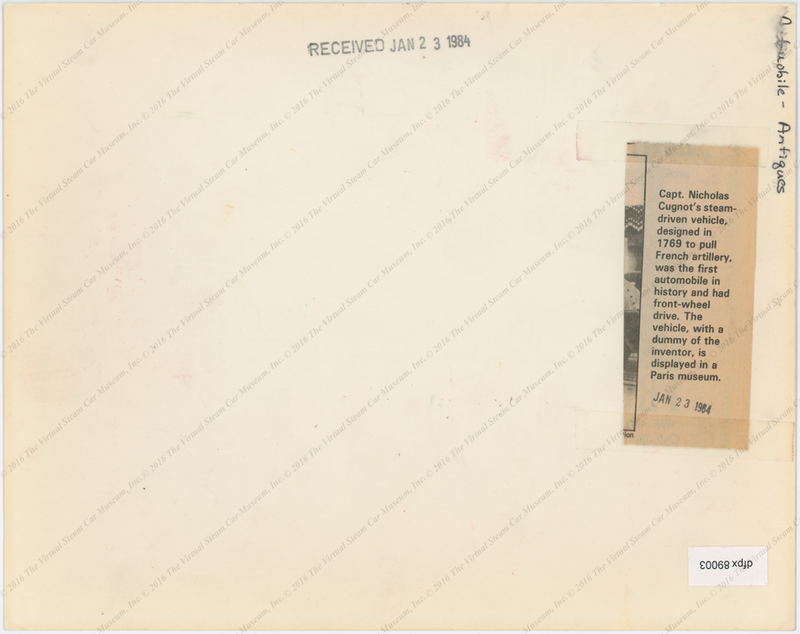 The Kellogg's Company produced a series of collector cards, date uncertain. 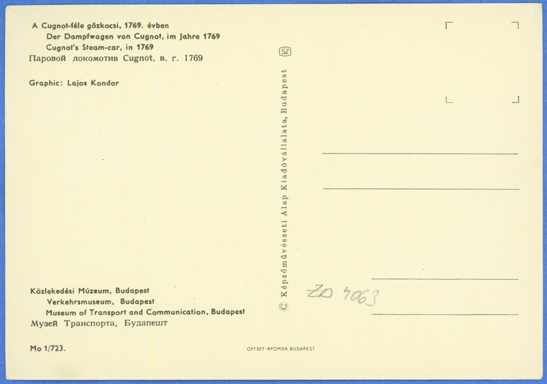 This is the second card in a series of 150. The Brooke Bond Tea Company produced a series of promotional cards. 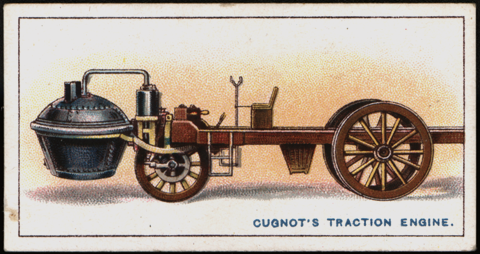 The Cugnot Steam Tractor was its first card. 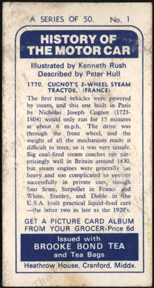 The The W. D. & H. O Wills cigarette company of Bristol and London produced a series of great invention cards. 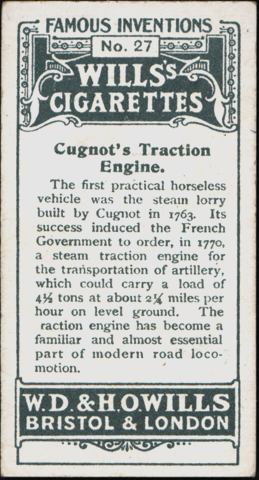 The Cugnot Traction Engine was Number 27. 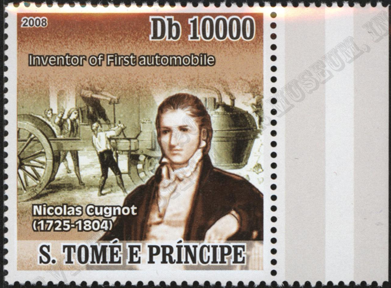 This commemorative stamp appeared in 2008. 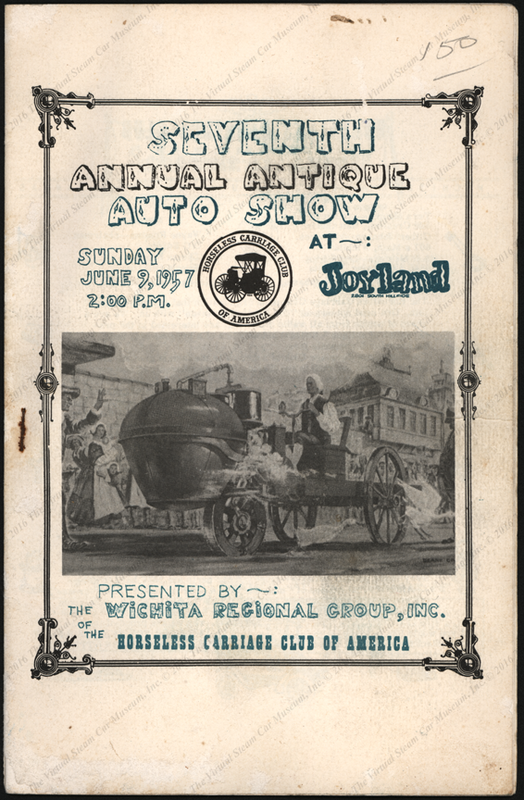 The Wichita Regional Group of the Horseless Carriage Club of America featured Cugnot's Steam Wagon on the cover of its June 9, 1957 car show program. This press photograph is dated January 23, 1984. 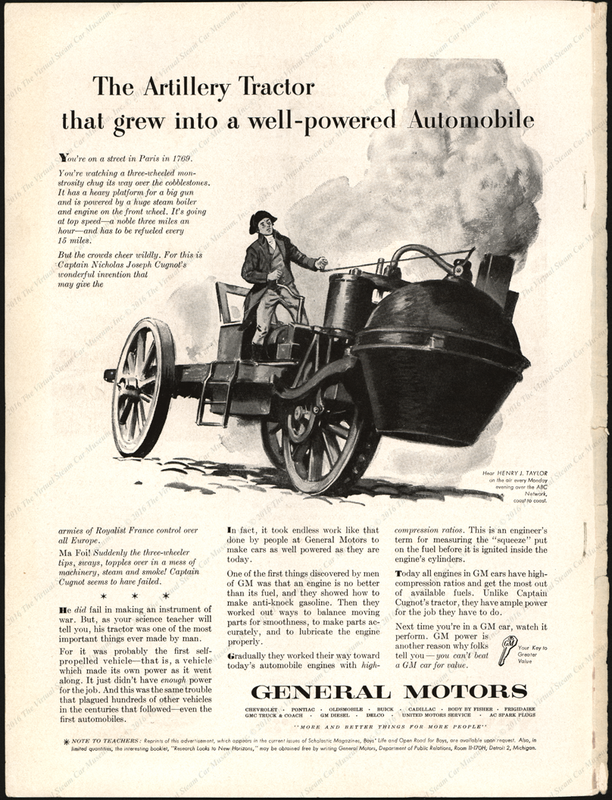 General Motors featured the Cugnot Steam Wagon in this March 1950 magazine advertisement in the inside cover of The Grade Teacher. The Society of Automotive Historians bestowed its prestigeious 2015 Ingersoll Award on the VSCM web site. 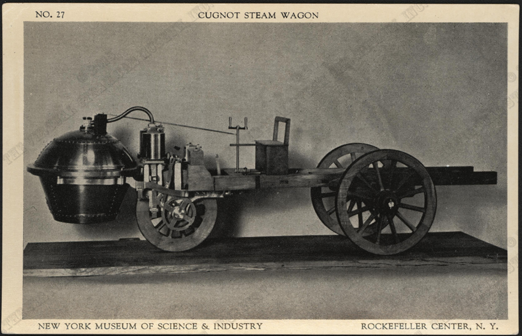 Contact us if you have additional information about the Cugnot Steam Wagon, or if you have questions.